It all comes down to this! 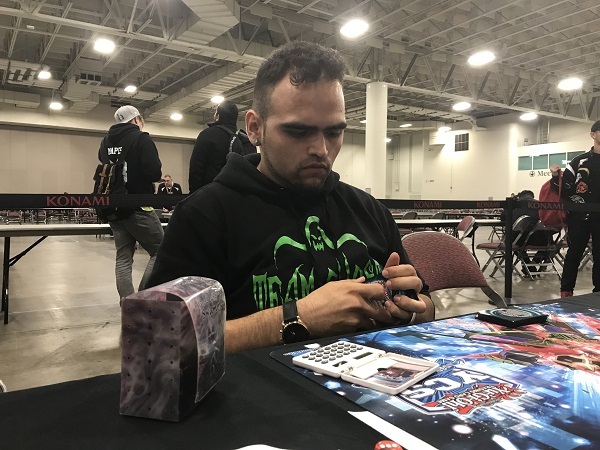 It’s a True Draco Mirror Match in the finals of YCS Salt Lake City 2018! Alessio Giordani from Florence, Italy takes on Leonard Anaya from Albuquerque, New Mexico. 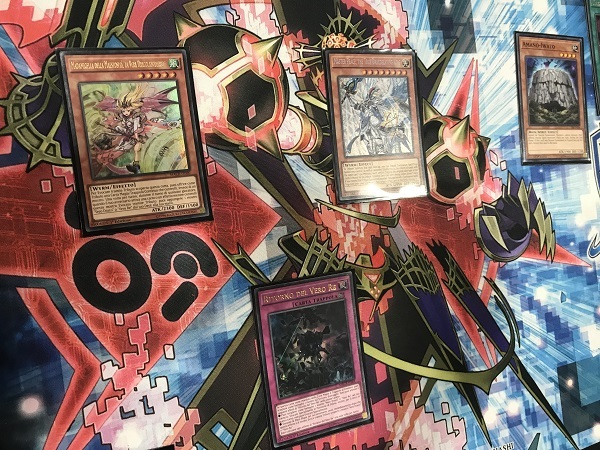 Who will walk away with an Ultra Rare Number 89: Diablosis the Mind Hacker and the title of YCS Champion? For the final time this weekend, it’s time to Duel! Anaya won the roll and elected for Giordani to start. 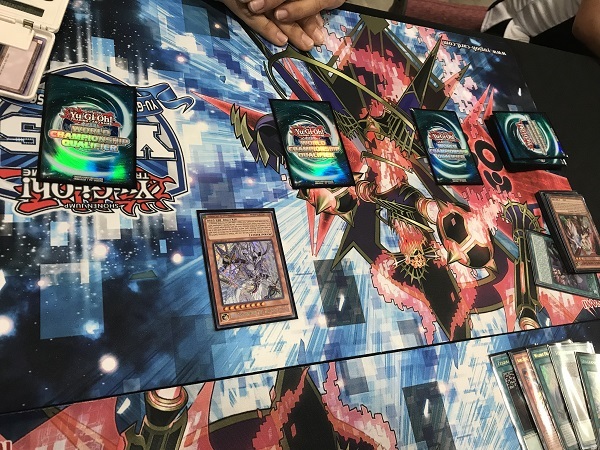 Giordani opened with a hand of Majesty Maiden, the True Dracocaster; Unending Nightmare; Master Peace, the True Dracoslaying King; Amano-Iwato; and True King’s Return. He Set Unending Nightmare and True King’s Return and passed. Anaya started by Normal Summoning Amano-Iwato then activated Pot of Duality, revealing all 3 copies of Terraforming! He took one of them and then activated it to add Dragonic Diagram from his Deck to his hand. He then activated Pot of Desires, banishing 10 cards to draw 2 more. 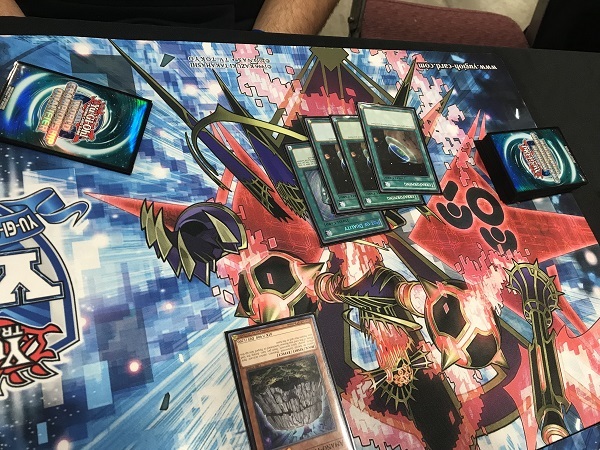 Anaya then activated Dragonic Diagram, Set 2 cards, and activated Dragonic Diagram’s effect; but Anaya Chained Unending Nightmare, paying 1000 LP to destroy Anaya’s Dragonic Diagram. Amano-Iwato attacked for 1900 points of damage, dropping Giordani down to 5100 LP. Amano-Iwato returned to the hand in the End Phase. Giordani drew True Draco Apocalypse. He Set it and Tributed it to Tribute Summon Majesty Maiden, the True Dracocaster. Maiden attacked directly. Anaya Normal Summoned Amano-Iwato then Set 2 more to the back. He then activated Card of Demise, drawing 2 cards. He flipped the Set Heritage and used the effect to Tribute Summon, but Giordani Chained Unending Nightmare, paying 1000 LP to destroy Anaya’s True Draco Heritage. Anaya Set a card, then in the End Phase, Anaya discarded Majesty Maiden, the True Dracocaster and returned Amano-Iwato to his hand. Giordani drew Card of Demise for his turn to add to his hand of Amano-Iwato and Master Peace, the True Dracoslaying King. He Normal Summoned Amano-Iwato and attacked with it, but Anaya activated True King’s Return to Special Summon Majesty Maiden, the True Dracocaster from the Graveyard. Amano-Iwato redeclared its target to Maiden and in the Damage Step, Anaya activated his Set True Draco Apocalypse, destroying True King’s Return to shrink Giordani’s field. Damage went through and Giordani took the damage and went down to 3550 LP to Anaya’s 5700 LP. In Main Phase 2, Giordani activated Card of Demise, drawing another Amano-Iwato and a Disciples of the True Dracophoenix. He activated Disciples, using the Summon effect to Tribute Unending Nightmare and Disciples to Summon Master Peace, the True Dracoslaying King. Disciples’s Graveyard effect destroyed Anaya’s Set Skill Drain. In the End Phase, Giordani discarded the Amano-Iwato in his hand and then returned the Amano-Iwato on his field to his hand. Giordani also used Master Peace, the True Dracoslaying King’s effect, banishing Unending Nightmare to destroy Anaya’s face-up True Draco Apocalypse. Anaya Normal Summoned Amano-Iwato, then activated Dragonic Diagram, using its effect to destroy the Set The Monarchs Erupt to add Disciples of the True Dracophoenix to his hand. He used the effect of Disciples to put True Draco Apocalypse, True Draco Heritage, and Disciples of the True Dracophoenix back into the Deck to draw a card. He Set a card to the back and returned his Amano-Iwato back to his hand. Still in the End Phase, Master Peace, the True Dracoslaying King used its effect to destroy Anaya’s Set True Draco Apocalypse and he activated True King’s Return to Special Summon Majesty Maiden, the True Dracocaster from his Graveyard. Giordani drew for turn and used the effect of Master Peace to destroy Anaya’s Majesty Maiden. Then Giordani Normal Summoned Amano-Iwato and all of the monsters attacked directly to end the Duel! 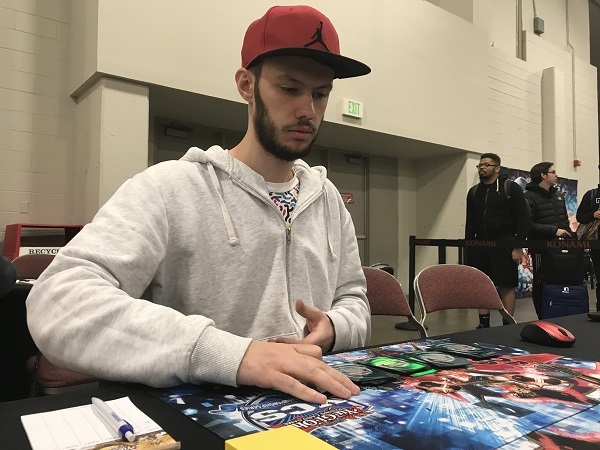 Giordani is one win away from a YCS victory! Anaya elected for Giordani to go first in Duel 2. He started with a hand of Ignis Heat, the True Dracowarrior; Terraforming; True Draco Heritage; Disciples of the True Dracophoenix; and Zaphion, the Timelord. He started with Terraforming, adding Dragonic Diagram from his Deck to his hand. He activated Dragonic Diagram, Set Disciples of the True Dracophoenix, then activated Dragonic Diagram’s effect, destroying the Set Disciples to add True Draco Apocalypse from his Deck to his hand. He Set it and then Tributed it to Summon Ignis Heat, the True Dracowarrior. Giordani then activated Heritage and tried to use the effect, but was met with Anaya’s Ghost Ogre & Snow Rabbit. Giordani Chained Ignis Heat, the True Dracowarrior’s effect to add Disciples of the True Dracophoenix from his Deck to his hand, which was activated, sending True Draco Heritage, True Draco Apocalypse, and Disciples of the True Dracophoenix back to the Deck to draw True King’s Return. He Set Return and passed. Anaya activated Raigeki and Giordani Chained Ignis Heat, the True Dracowarrior’s effect to add True Draco Heritage from his Deck to his hand. Anaya then activated Terraforming to add his own Dragonic Diagram to his hand and he activated Upstart Goblin to draw a card. Dragonic Diagram came down next. Anaya then Set True Draco Heritage and used Dragonic Diagram to destroy Heritage and add another one to his hand. Anaya used the Heritage’s effect in the Graveyard to destroy Giordani’s Set True King’s Return. Giordani Chained it to Special Summon Ignis Heat, the True Dracowarrior from the Graveyard. Anaya then activated True Draco Heritage and used the effect to draw 3 cards! He then activated Pot of Desires, banishing the top 10 cards of his Deck to draw 2 more cards. He then used the effect of Heritage to Tribute it for Majesty Maiden, the True Dracocaster. Next, Pot of Duality came down, revealing Cosmic Cyclone, Terraforming, and Amano-Iwato. He picked Cosmic Cyclone to add to his hand, shuffling the rest back. He then activated Disciples of the True Dracophoenix, then Set a card. Then he used Disciples of the True Dracophoenix’s effect to Tribute Summon, Tributing Majesty Maiden, the True Dracocaster and the face-down True King’s Return to Tribute Summon Master Peace, the True Dracoslaying King. He then used Disciples of the True Dracophoenix’s effect to shuffle 3 cards back to draw a card. He attacked with Majesty Maiden, the True Dracocaster leaving Giordani at 5750 LP. In Main Phase 2, Anaya Set 3 cards to the back and passed. Giordani drew Terraforming. He attempted to use Dragonic Diagram, but Anaya Chained Cosmic Cyclone to banish Giordani’s Set Disciples of the True Dracophoenix. The Field Spell effect resolved, forcing Giordani to destroy the True Draco Heritage in his hand to add Disciples of the True Dracophoenix from his Deck to his hand. Giordani then Normal Summoned Zaphion, the Timelord! It attacked Master Peace, the True Dracoslaying King for no damage and in the end of the Battle Phase, Zaphion’s effect activated to shuffle all of Anaya’s Set cards back to the Deck; but Anaya Chained Cosmic Cyclone to banish Giordani’s Dragonic Diagram. The rest of Anaya’s Set cards went back to the Deck. Giordani activated Disciples of the True Dracophoenix and tried to use the effect, but Anaya’s Master Peace, the True Dracoslaying King blasted it away. Giordani then used Terraforming to add another Dragonic Diagram to his hand. He passed. Giordani drew True Draco Apocalypse. Zaphion shuffled back into Giordani’s Deck during the Standby Phase. He Set True Draco Apocalypse and activated Dragonic Diagram, using the effect to destroy the Set True Draco Apocalypse and add Disciples of the True Dracophoenix from his Deck to his hand. He used the effect to shuffle cards back into the Deck, Anaya allowed it, and Giordani drew Forbidden Chalice. Anaya drew and attacked with Master Peace, the True Dracoslaying King. He Set one card then activated Card of Demise, drawing 3 cards. He Normal Summoned Ghost Ogre & Snow Rabbit, Set 2 cards to the back row and passed. Giordani drew Imperial Iron Wall for his turn. Giordani activated Dragonic Diagram, but Anaya Chained the on-field Ghost Ogre & Snow Rabbit to destroy Giordani’s Dragonic Diagram! Giordani conceded, unable to deal with Anaya’s Master Peace. We’re going to a final Duel to decide the tournament! Giordani elected for Anaya to go first in Duel 3. Anaya passed making no plays. Giordani drew, starting with a hand of True Draco Apocalypse, Card of Demise, True Draco Heritage, Pot of Duality, Terraforming, and Disciples of the True Dracophoenix. He activated Terraforming, adding Dragonic Diagram to his hand. He activated Pot of Duality, revealing Amano-Iwato, Forbidden Chalice, and another Dragonic Diagram. He picked Amano-Iwato and shuffled the rest back. He Normal Summoned Amano-Iwato then activated Dragonic Diagram. He Set Disciples of the True Dracophoenix, then used Dragonic Diagram to destroy the Set Disciples to add Majesty Maiden, the True Dracocaster to his hand. He activated True Draco Heritage, using it to draw another Disciples of the True Dracophoenix. He used the Tribute Summon effect of Heritage to Tribute it to Summon Majesty Maiden, the True Dracocaster. He attacked with both monsters, Set True Draco Apocalypse, and bounced Amano-Iwato back to his hand in the End Phase. Anaya Normal Summoned his own Amano-Iwato. Then he activated Pot of Duality, revealing Card of Demise, True Draco Apocalypse, and Ignis Heat, the True Dracowarrior. He added Card of Demise to his hand, sending the rest of the cards back to the Deck. 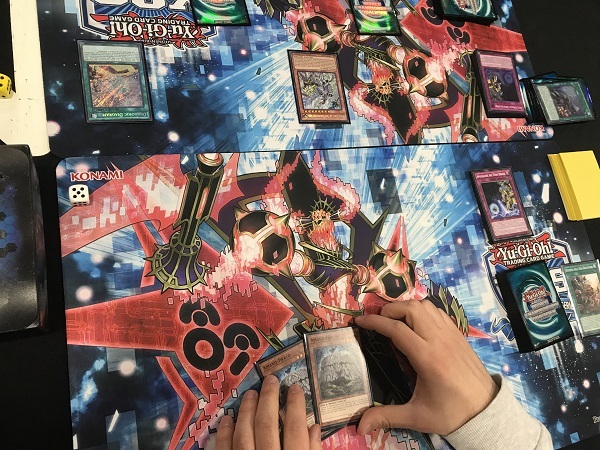 He activated his own Dragonic Diagram, Set True Draco Apocalypse, and activated Dragonic Diagram, destroying the Set True Draco Apocalypse to add True Draco Heritage to his hand. He used True Draco Apocalypse’s Graveyard effect to destroy Giordani’s Majesty Maiden, the True Dracocaster. Anaya then activated True Draco Heritage and used its effect to draw 2 cards. He then activated Terraforming to add another Dragonic Diagram from his Deck to his hand. He activated a new Diagram over the old one, using its effect to destroy the on-field Heritage to add Disciples of the True Dracophoenix from his Deck to his hand. He didn’t activate Heritage to destroy Giordani’s Set card. He activated Pot of Desires, banishing the top 10 cards of his Deck to draw 2 more. He activated another Heritage, then used the Tribute Summon effect, Tributing it and Amano-Iwato for Master Peace, the True Dracoslaying King! Once again, he didn’t use the Spell destruction effect. He then activated Disciples of the True Dracophoenix, Set 2 cards, and attacked with Master Peace for 2950 points of damage, leaving Giordani at 5050 LP. In Main Phase 2, Anaya activated Card of Demise, drawing 3 cards. He activated Master Peace’s effect to destroy Dragonic Diagram. He Set all of the cards in his hand but one. In the End Phase, he discarded Ash Blossom & Joyous Spring for Card of Demise. Giordani drew True Draco Heritage. He activated Disciples of the True Dracophoenix, but Anaya used Cosmic Cyclone to banish it. He Normal Summoned Amano-Iwato, then Set True Draco Heritage and activated Card of Demise; but Anaya Chained Solemn Judgment! Anaya goes down to 1250 LP to stop Giordani from drawing 3 cards! Giordani then flipped the Set True Draco Heritage. Giordani attacked with Amano-Iwato and in the Damage Step, Giordani activated his Set True Draco Apocalypse, destroying the True Draco Heritage to shrink Anaya’s field. Anaya has 825 LP to Giordani’s 5050 LP. Anaya used Disciples of the True Dracophoenix’s effect to shuffle 3 cards back to draw a card. He used Dragonic Diagram’s effect, destroying his Set Terraforming to add Master Peace, the True Dracoslaying King from his Deck to his hand. He Set a card then Tributed it and Disciples of the True Dracophoenix to Summon Master Peace, the True Dracoslaying King. Disciples’s effect destroyed Giordani’s True Draco Apocalypse and he attacked directly. Giordani drew Amano-Iwato and revealed it and the other Amano-Iwato in his hand. He extended the handshake! Leonard Anaya is your YCS Salt Lake City Champion!